I recently had the honor of spending time with the Kansas City Chapter of the Association of the United States Army. Retired Maj. Emma Toops, chapter president, and the Greater Kansas City Chapter were my hosts for a fun and event-filled two days in this wonderful mid-western Missouri city with many historic sites and a forward-thinking focus on the future. One of the unique opportunities I had during my first few hours on the ground was to visit one of the chapter’s outreach initiatives called the Veterans Community Project. The Veterans Community Project’s mission is to provide the means for homeless veterans to get off the street and back on their feet to lead productive lives and contribute to society and the community. Retired Sgt. 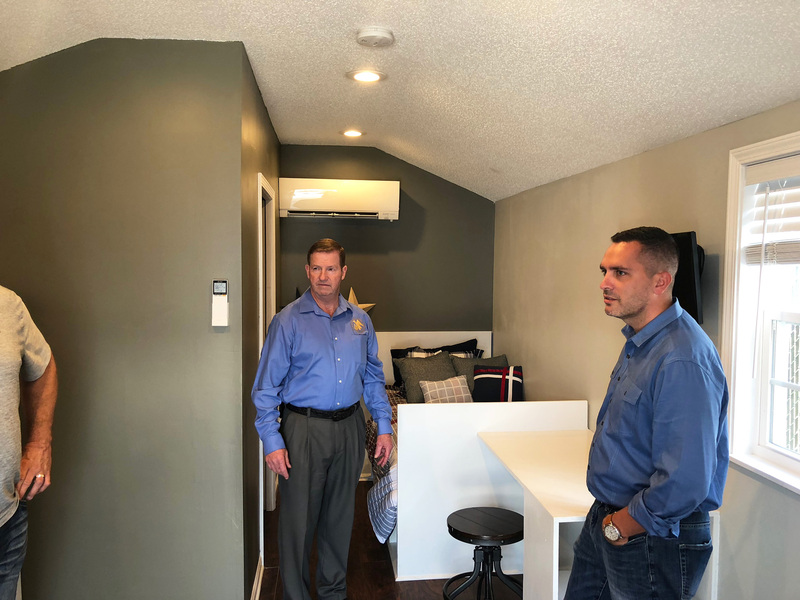 Maj. of the Army Ken Preston, AUSA vice president for NCO and Soldier Programs, right, and Army veteran Chris Stout, a founder of Veterans Community Project, tour the site where 13 tiny homes have been constructed with 13 more underway. The founders of the Veterans Community Project are Chris Stout, an Army veteran; Kevin Jamison, a Marine veteran; and Mark Solomon, a Navy reservist. Seeing the reports of thousands of homeless veterans nationwide, these veterans decided to do something to make a difference – and make a difference they did. The initial intent of this program was to provide a service center for veterans, a one-stop shop where a homeless veteran will receive counseling and mentorship for recovery and to also receive educational assistance to gain the skills needed to be competitive in the job search market. This beginning grew into the awesome mission they execute today. Stout serves as the president of the Veterans Community Project and was the first partner to join with Jamison, followed later by Solomon. Stout was an Iraq veteran deployed to Afghanistan in 2005 when he was wounded and medically retired. Struggling with his injury and PTSD, he found comfort, purpose and enjoyment being around veterans. It was this love of service and the desire to continue to serve those who served that led him to a job connecting veterans to the services they needed. But in helping veterans, Stout saw the gaps and seams that left many veterans with no place to turn for help. In 2015, Stout, Jamison and Solomon quit their jobs and started the Veterans Community Project. After his Marine Corps service, Jamison was working with homeless veterans and their homeless shelters. Learning from these experiences, Jamison discovered that homeless shelters were not the place where all homeless veterans wanted to live. Jamison talked with me about an elderly veteran on crutches known on the street as White Hawk, a Cold War Army veteran with service in Germany. White Hawk lived in a tent in a wooded area where he heated the tent with candles during the winter months, used food stamps to eat and panhandled for the money he needed to survive. Since 2009, after being released from prison with a felony conviction, White Hawk has lived homeless, unable to find a job. He was one of those veterans who chose not to live in a homeless shelter. Stout, Jamison and Solomon have found many homeless veterans did not like the traditional shelters because they were unsafe or lacked privacy. This personal understanding for how veterans felt about the world where they lived brought the tiny house idea to life where a veteran could have privacy in a safe and secure environment while integrating back into society. Each of the tiny homes the Veterans Community Project build are approximately 240 square feet and provide the veteran with a bed, bathroom and shower, kitchen, living room and desk, all packaged into an orderly studio apartment. Preston and Stout examine the inside of a tiny house built for homeless veterans. Each home costs approximately $10,000 and comes with furniture, appliances, dishes, linens and food. “The tiny house provides everything these guys need to live with dignity, safety, and then [we can] fix what got them there in the first place,” said Stout. The goal for the organization is to get the veteran back on their feet and living on their own within one year. “Our anticipated length of stay is six months, but as long as they’re working toward their goals, they’re welcome to stay. We see these tiny homes as an educational tool to teach them how to maintain a home, cook for themselves and live next to neighbors,” said Stout. With the initial 13 tiny homes and 13 more under final construction at the time of my visit, the Veterans Community Project plans to complete a total of 49 homes on the four-acre lot along with a walking trail and park area. Each of the homes cost approximately $10,000 and they come fully furnished with appliances, furniture, dishes, linens and food. Stout said the first tiny house they attempted to build was essentially a garden shed they converted, but the structure did not meet the building codes for occupancy. The dynamic trio learned many valuable construction lessons on that first house which later set them up for success by supervising volunteers as more houses were constructed. Even if the homeless veteran has a source of income as they find work and begin their transition back into society, they pay nothing. Thanks to all the generous donations from community members, businesses and the city leadership to make this dream a reality and a lifesaver for thousands of homeless veterans in the Kansas City area. The Veterans Community Project’s community center is situated in south Kansas City, just across the street from the tiny houses village where a veteran who walks in the door can get a donated bus pass, job placement, housing placement, legal services, access to the food pantry, a clothing closet and emergency financial assistance. To date, the community center has helped over 8,000 veterans, from small simple needs to more complex problems like alcohol and drug addiction, and by offering educational classes to attain the credentialing, licensing or certifications needed for a job. The new community center originally was an old abandoned service station that needed a total renovation to make the building habitable. Stout said the city helped them through the petroleum and hazardous material cleanup in and around the facility and throughout the renovation. The city also sold the Veterans Community Project the four-acres needed to build the tiny village. “We’re called the Veterans Community Project because we are the community’s project. We want people to feel they have ownership of this, and we want everybody to pitch in,” said Stout. If you want to learn more about the Veterans Community Project check out its webpage at https://www.veteranscommunityproject.org/. “We are working in Denver, Nashville and St. Louis now with a goal to be in every major city,” said Stout. A special thank you to retired Maj. Emma Toops, Greater Kansas City chapter president, and the chapter leadership for supporting the Veterans Community Project and for hosting and sponsoring my visit.